This exhibit is devoted to this one very unusual coin spoon which was made by Tiffany & Co. 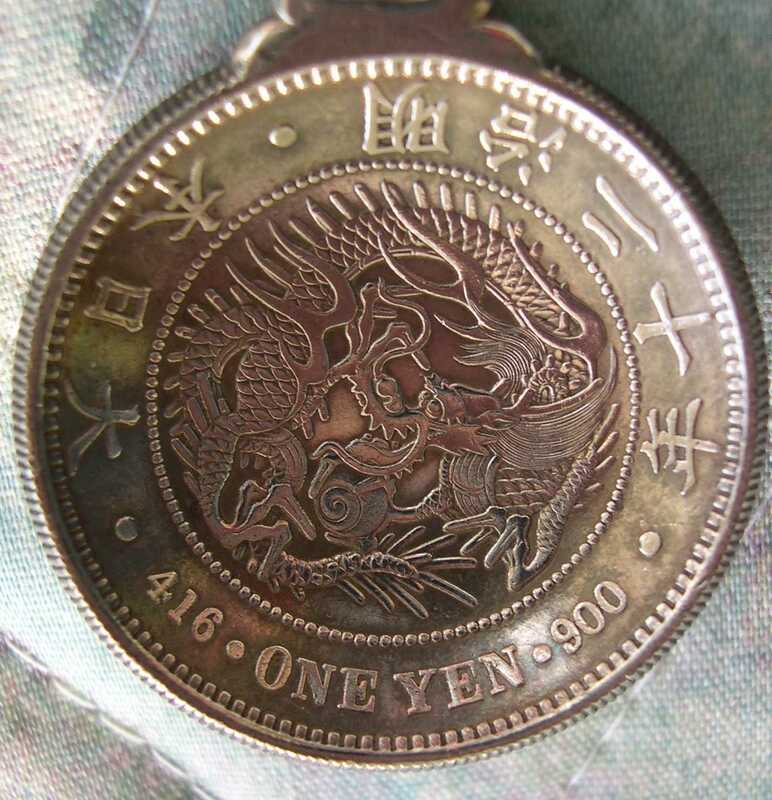 The beautiful 1 Yen Meiji Japanese dragon coin can be compared to the Chinese Dragon coin in terms of design and execution. For both the Chinese and Japanese, the dragon is very revered and the emperors are supposedly descendants of the all-powerful, mystical and majestic dragons! 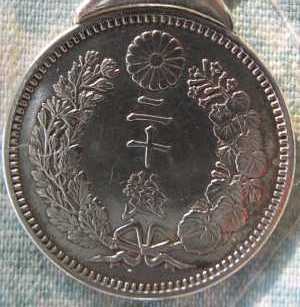 Read it as the clock starting with the top character is Mei - ji - 2 - 10 - year - 900 - Yen - One - Dai - Nip - pon. To get the era year put a 'x' (multiply sign) between the 2 (=) and the 10 (+) equals 20. This is 1887 AD. 'Dai Nippon' means 'Great Japan'. 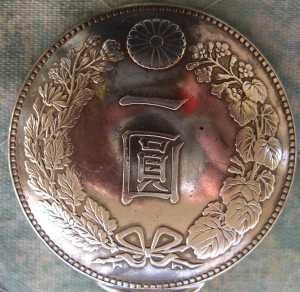 On the other side is the Chrysanthemum which is the national flower of Japan with the characters for 1 (-) and Yen. The '900' is the purity' and I think the 416 is the actual silver weight in milligrams." I had guessed that this spoon was in the mid 1890's, but this information means that the spoon is ca. 1887 (this was an uncirculated coin) and was the first year of issue for this coin. I think that this helps explain why this piece was commissioned. Mr. Gardner also pointed out that this coin in uncirculated condition would sell for over $150. 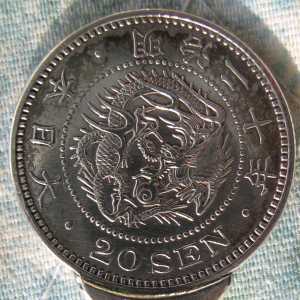 However, because it has been bent into a bowl shape and soldered, it no longer has a numismatic value. But it still retains a strong value within the spoon. The only mark is "Tiffany & Co. sterling"
I am trying to learn more about this spoon, I suspect that it was a special order to honor someone for their efforts in Japan. The fact that it was made in the USA by Tiffany instead of in Japan is the first clue that it has a deeper history. Please contact me if you have any information on this spoon.